Not sure if you're a caker? Or if the food on this blog is edible? Here are some answers to questions you might have. In short, an Anglo-Saxon who cooks with Cheez Whiz, Cream of Mushroom soup and Cool Whip. The word “caker” is a short form of “mangicake,” a term coined by Italians. For my personal caker journey, click here. That depends. Did you grow up throwing spaghetti against a wall to check if it was done? Were most of your meals served in a single dish? Was JELL-O considered a vegetable? If “yes,” welcome to the club. You’re a caker. What’s the difference between caker and white trash cooking? Caker cooking seems to be uniquely Canadian. White trash cooking is American. White trash cooking is about cheapness. Caker cooking is more about convenience. White trash cooking takes pleasure in its garishness whereas caker cooking is more dignified. Bottom line is that you’ll never see a crown roast made of hot dog wieners on this blog. Are the recipes any good? Let me put it this way - most of the recipes I post come from small communities. Whoever submits the recipe includes his or her name. Usually, this person is a woman. If this woman submits a crappy recipe that wastes the time and money of her friends, co-workers and fellow church goers, well, just watch her try to find a Bridge partner the next time she needs one. I’ve been collecting cookbooks and recipes over the years. I’ll always post the source of the recipe and an image of the cookbook cover if I have it. Many of the recipes you see are from church cookbooks. That’s not to say all church cooking is caker cooking. I’ve simply pulled the best caker recipes from them. To see my cookbooks and the recipes I've featured from each one, click here. Every Monday, come hell or high cholesterol. Sometimes, I'll post reader recipes on Fridays. What makes a recipe a "caker" recipe? 1) A “magic” ingredient. We cakers love to think we’ve discovered some sort of short cut. Usually, this short cut requires a can opener. 2) Ease. The recipe has to have as few steps and as few ingredients as possible. 3) Frugality. There’s nothing more wasteful than spending good money on food. Just heard your interview on The Next Chapter and it brought back a lot of good memories of comfort food from days gone by. I'm sure you have more than enough recipes to get through but I wanted to let you know about one of my favourites, crushed pineapple carrot mould. Don't know if it qualifies because the recipe is, as far as I can tell from Google, http://www.recipelink.com/mf/31/50547, from a 1950s Libby's can label. No need for a special mould, an 8 x 8 cake pan will do. Whipping the cream may also disqualify it, but Cool Whip could probably be used in a pinch. It is, though, always served with the meal, and not as a dessert. Thanks for the fun website. Thanks for the recipe and I'm glad you enjoyed the interview. Hmm. Vegetables and fruit in JELL-O. I have to be honest - I've always been a little frightened of some of the JELL-O recipes I've come across in my cookbooks. But pineapple and carrot might not be a bad combination. After all, what's in a carrot cake? I'll add this one to my recipe roster and will let you know if I make it. Coming from a large family it is one of the few dishes we all insist on at Christmas. Even newly incorporated family members, aka in-laws, have taken up the tradition with their families. Won't promote it too much though as most things fail to live up to their hype, especially when it comes to peculiar family traditions. Will be very interested in your review if you do make it. I came here by way of the CBC as well - good interview. Only thing I take issue with is the idea that these recipes are all somehow uniquely Canadian...some are, but similar versions of most of the dishes turn up in many of the church or community group cookbooks from south of the border as well (I think you have one or two from the States listed in your references). Trust me, cheap, easy, and yes, garish caker foods can be found north of the border as well. Borderline-disgusting yet oh-so-comforting food seems to be a North American experience - wherever people had access to the free promo recipes from Campbells, Jello, General Mills etc. You might think I`m being nit picky - but heck, this is the `net, and only a few weeks ago the same discussion was had on a board I shall not name - let`s just say Canadians, southerners, midwesterners, and Californians all claimed the stuff as their own. I am off to look for my `Lioness Clubs Cooking around the World`. You raise a valid point. And I have many Americans who visit this blog. For me, the distinction is in the categorization of the food. To the best of my knowledge, "mangiacake" is a Canadian term. So that's why I've called the food as such. Hope you found your Lioness Clubs cookbook. Sounds like a good one! "Mangiacake might indeed be a Torontion term; I never heard it until I arrived and my Italian SIL schooled me. Alas, it seems I lost all of my service club/agricultural/church group cook books in my divorce. Oh no! Luckily, I spent a few summers working in a restaurant in SW Ontario where we actually served caker foods (and got paid for it). Will forward recipes when I can get my mind around them. So funny. When I heard you today I thought yes yes I am a caker. I came right home and made Tomato Soup cake. Wow is it ever good. My food growing up consisted of canned corned meat, klick (loved it fried), canned peas and corn, mushroom soup on everything, matrimonial cake, sugar on bread, cheese whiz, kraft dinner, shepherds pie witth canned peas in it and canned corn on the side. I could go on and on and on. Never had salad much at all. But turning 60 I thought I should eat healthier now. Love your blog and the review on the radio. I'm glad you enjoying your blog. And Tomato Soup cake is delicious. For anyone who hasn't tried it, give it a whirl. I think you'll be pleasantly surprised. Just don't tell anyone what's in it! I also heard you on the CBC, I was shocked, there's a name for this type of cooking! My growing up is described here exactly! Love it! Life feels so much more complete once you know you're a caker. "Caker cooking seems to be uniquely Canadian. White trash cooking is American." Not so fast! We Americans may not call it "caker" (or call it anything, actually) but there is certainly cheap, convenient cooking that is NOT "white trash" cooking. "I think it's less convenience, and more people in rural areas having no access to ingredient. Really small towns with one aisle grocery stores, mostly non-perishables and a meat and milk cooler. Like shopping at 7-11." Just found this blog - very interesting. My mum was a Caker cook until I was in university. Our family favourite for Christmas dinner is lime Jell-O with pineapple, mandarin oranges, and carrots. The "secret ingredient" is ginger ale instead of the cold water when making the jelly. It's a real palate-cleanser after turkey, stuffing, gravy, veggies, etc. Wonderful CBC interview -so glad there is a (sub)culture associated with the stacks of United Church Women's cookbooks that I have hidden in my cupboard! My favourite caker recipe has got to be the "Butterscotch PB Marshmallow Squares". Add "Butter" to the title, and you've got the entire ingredient list. I made these for a bake sale last Spring, and was lectured by my 78 year old neighbour on the crucial difference between "coloured marshmallows" and "fruit flavoured coloured marshmallows". Hint: DON'T USE FRUIT FLAVOURED MARSHMALLOWS. "It's just not right!" Those PB Marshmallow Squares are right up there with my all-time caker favourites, as well. I agree with your neighbour - NEVER USED THE FRUIT FLAVOURED MARSHMALLOWS. It's criminal, I tell you. I'm the man behind the caker. I'm also a fiction writer. 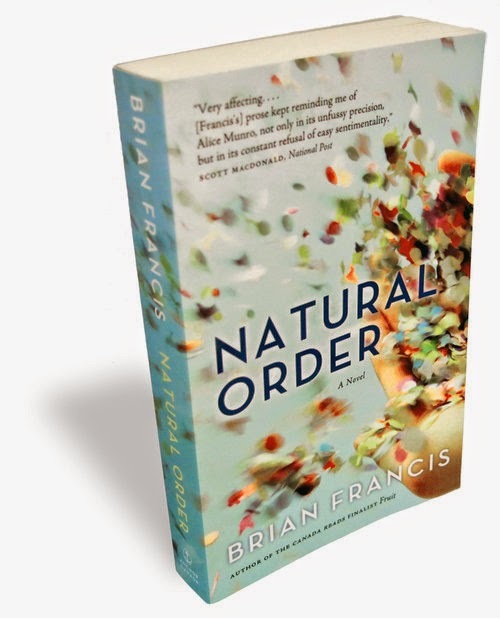 My most recent book is called NATURAL ORDER. 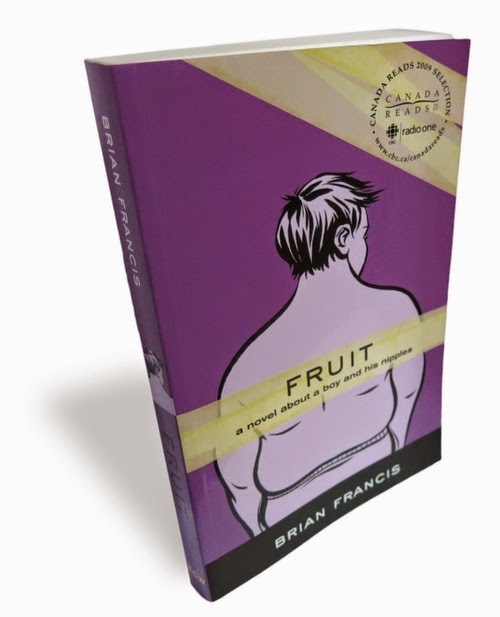 My first book is called FRUIT. Visit my blog on my author site.